1. Jesus comes with clouds at the rapture but on a horse at the Second Coming. There have been popular songs about Jesus coming on a white horse. And they are nice songs. But the truth of the matter is, the Lord comes on clouds of glory at the rapture to gather His people unto Himself while at the Second Coming, He comes to do battle and eradicate evil from the earth as He sets up the earth for His millennial reign. 2. 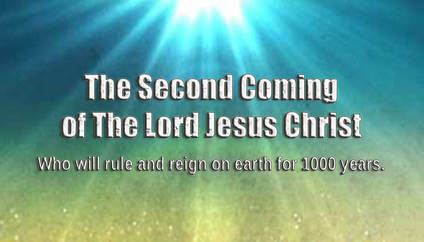 Jesus stops in the air at the rapture but comes to live on earth at the Second Coming. At the rapture, His intent is to seize His church from the enemies' hands. By this point the Two Witnesses will have been killed for 3 ½ days and the devil and his people will have been rejoicing and persecuting Christians who will be refusing the mark of the beast or the number of his name or to worship him. To the enemies' utter surprise, they will think it is now “peace and safety” for them, but the earth will shake and the atmosphere above will start to give way and the King of glory will come for His own. We get the word “rapture” from the word, “harpazo,” which means to “openly seize and take from” which is exactly how the Lord calls the true church up from this earth. At the Second Coming, the armies of heaven are with the Lord as the evil ones attempt to prevent His return. Of course, the Lord wins and stays (1 Thessalonians 4:13-18, Revelation 19:15-21,20:4-6). 4. At the rapture, the body of Christ will get their glorified bodies, including the dead in Christ who come with Him first, and then those who are alive (1 Thessalonians 4:13-18). At the Second Coming, everyone will already have their glorified bodies (having become like Jesus) and be returning with them (Revelation 19:14). 5. The judgment & wrath of God begin at the rapture. Every knee will have to bow and every tongue confess that Jesus Christ is Lord. The seven trumpets and seven bowls will fall upon wicked mankind who remain and meet their fate. The Second Coming is the conclusion of wicked mankind. Those not killed prior to Armageddon will be eradicated from the earth (Revelation 19:21). It will not be the time of bowing the knee and confessing, it will be “the physical end” of the wicked at that day. A Myth Rebutted: Some say that nothing has to happen before the rapture can happen but the Second Coming must be preceded by certain events. However, all the events of the future, including the rapture have a definite order and there are certain events that must happen first. Jesus told us much of what has to happen before the Rapture and it can be found throughout the Bible. Just read Matthew 24:8-51, Mark 13:13-37, Luke 21:10-36 and 2 Thessalonians 2:1-17 and it will become clear that there is much to happen before the rapture. God is orderly. The events of the past, present and future are all orderly. The events and information about them are told to us so we can even have a sense of order. Some people do not consider it much, but the Second Coming happens upon a “devastated” earth. There is no doubt that there will be restoration and it may take some time for it, but some think that this is when there will be “a new earth and new heaven.” Revelation 20:11 and Revelation 21:1 show that this old earth and heaven (universe) are not destroyed until the Great White Throne of Judgment. Following which, there will be a completely new heaven and new earth and upon it will be the Holy City. If you listen closely to some Christians of the “kingdom now” movement or following, they have a huge tendency to misinterpret “millennial Bible verses” ahead of time and this includes thinking the new heaven and earth will precede the Millennium and Great White Throne of Judgment.